marcy and i got together to watch the miss american pageant a few weeks back. 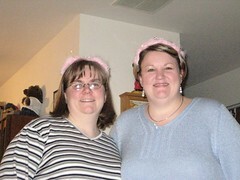 of course, the night wasn't complete without wearing a princess tiara!!!! ok, so you had to be there, i guess.